From your twitter feed stenogmog??? Fine ya sunsabithches....I guess I wanted to keep whoopin' the esquire so bad..I found a facsimile. I paid less income tax than last year. Kinda interesting how many of those accounts have random numbers in the name. I am paying quite a bit less. I'm paying a smaller % of my gross income than I have in a long time. I am solidly middle class and I paid about 1.3% less in taxes this year compared to last. That was on a higher income than last year too. their refunds are smaller, one of the changes in the withholding tables was to put more of folks money in their pockets when they get paid. 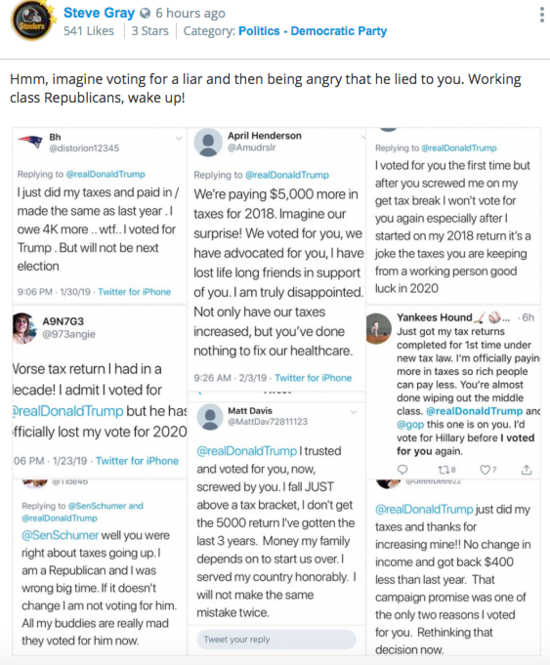 So if you made the same as last year and didn't change your withholding, your refund is going to be smaller, and folks perceive that as paying more in taxes. Very few folks have any idea what their taxes are. That is why when I compared my taxes this year to last year I compared my effective tax rate. Also, they should set up their withholdings so that they are not getting 1,000+ doallar refunds. 3. From your twitter feed stenogmog??? Gothmog doesn't have a record. 16. Fine ya sunsabithches....I guess I wanted to keep whoopin' the esquire so bad..I found a facsimile. 4. I paid less income tax than last year. 8. Kinda interesting how many of those accounts have random numbers in the name. It wouldn't be the first astroturf online campaign lefty got caught using. If there are any real ones, my money is on them being in high tax blue states that don't give them a deduction for federal taxes. 9. Did you say something? It sounds like your mouth is full of Marbles. 10. This is your "evidence"? A small pattering of unverifiable claims from your twitter feed? 11. I am paying quite a bit less. There shouldn't be any paycheck withholding. Everyone should have to write a check to the government for the whole amount every three months, just like small business. All that is going on here is a bunch of people that failed high school math. 12. I'm paying a smaller % of my gross income than I have in a long time. I'm transitioning from income to accumulated wealth as the basis of my living needs. Next year there will be a huge drop in what the government steals from me.